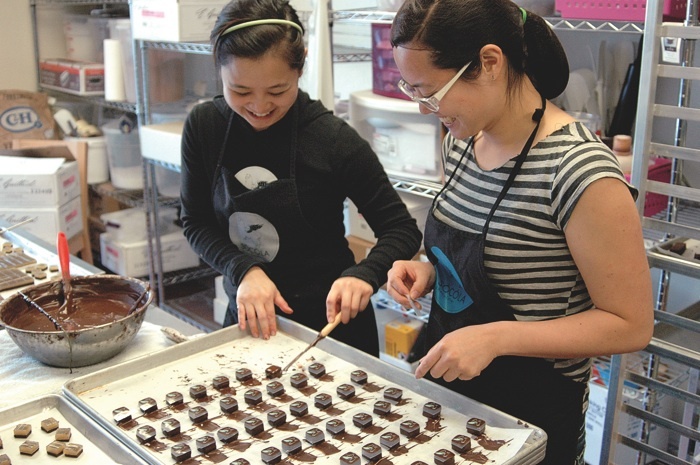 In the Sôcôla kitchen, sisters Wendy (left) and Susan Lieu dip a few dozen chocolate truffles laid out on baking parchment. The upscale chocolates—boxes of a dozen, like these, retail for $25 each—draw on flavors from Vietnam and the rest of the world. 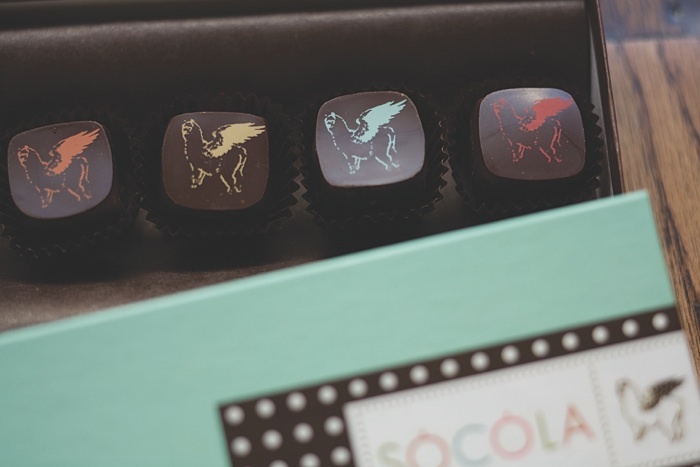 The whimsical Sôcôla logo, a winged alpaca nicknamed “Harriet,” appears in various colors on some of the truffles. The sisters with their “Duchess of Earl” Earl Grey-flavored truffles. After dipping, they push each one to the side to prevent a trailing “foot” of excess dipped chocolate. It’s a Saturday night in San Francisco. 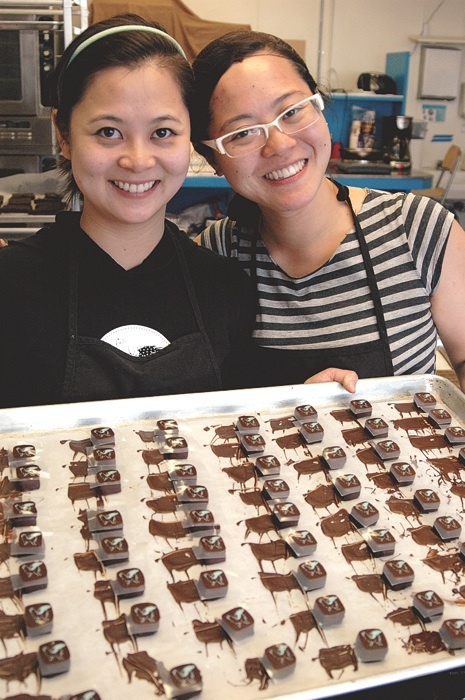 Time feels tight for Susan Lieu ’07 and her older sister, Wendy, founders of Sôcôla Chocolatier. 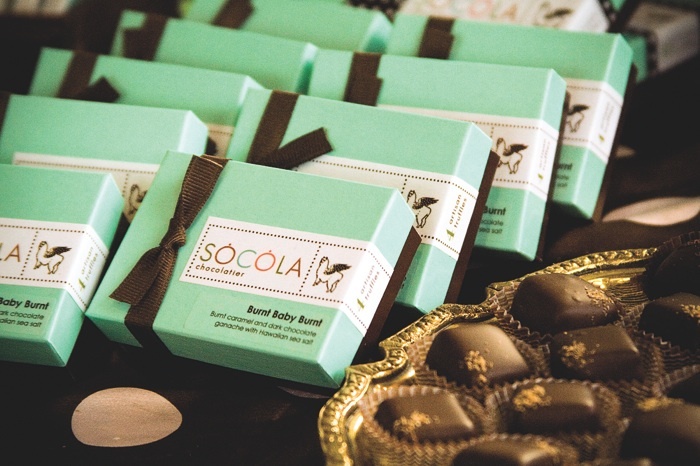 (Sôcôla, from the French chocolat, means “chocolate” in Vietnamese.) They must make 1,200 more truffles--pear pâte de fruit, yuzu ginger, jasmine tea, and burnt caramel with red Hawaiian sea salt. What sets the sisters’ confections apart are their inventive Eastern- and Western-inspired flavors, perfected confection, and playful packaging. These truffles--some with sassy names like Give It To Me Guava and Notorious H.O.G. (a play on the stage name of the late rapper The Notorious B.I.G.) --are tantalizing taste buds and winning prizes. Even so, with only a few basic ingredients--chocolate, butter, cream, and a given batch’s special flavor, such as guava--they find time to create truffles for all tastes. Environmentally conscious food producers, they curb their greenhouse-gas emissions by buying locally produced, organic ingredients whenever possible. They use E. Guittard’s 72 percent dark chocolate: “It’s local, family owned and operated, and it has a rich chocolate taste that doesn’t overpower other flavors,” says Susan. The sisters always follow Wendy’s time-tested confectionary regimen: smooth, dense, creamy ganache coated in a shiny dark chocolate shell. The rest of the magic is in the science of truffle-making: ingredient ratios and the tempering of the chocolate--the process of heating and then cooling it for stability, a nice crunch, and a smooth shine. Their jasmine tea truffle recipe (detailed on www.instructables.com) begins with mixing and boiling cream and invert sugar, then letting the liquid steep with loose jasmine tea leaves away from the heat. Straining, re-boiling, pouring into melted chocolate, and adding butter follow, as do refrigerating, spreading, dipping, and garnishing. This evening, kitchen conditions are perfect. Wendy’s happy with her ganache--it’s firm, velvety, and the flavor releases on the tongue. The liquid dark chocolate has been tempered just so. The air conditioning keeps their rented kitchen cool for chocolate hardening. Standing opposite one another, the sisters dip ganache squares topped with pear pâte de fruit into dark chocolate and drag it an inch on the parchment-lined tray to lose the excess coating. As they reach for the next one, a long-time assistant applies the garnish--in this case, a cocoa-butter transfer of their trademark, a winged alpaca the sisters call Harriet. The Lieu sisters’ parents escaped Vietnam by boat after the war and lived in refugee camps for two years before starting their own gardening and nail-salon businesses in the Bay Area. After Harvard, Susan worked on a government-run sustainable cocoa development project in Vietnam while staying with family in the Mekong Delta. She returned to San Francisco for her Coro Fellowship (the nonprofit program trains fellows for “effective, ethical leadership in public affairs”)--and with her aunt’s recipe for a Vietnamese dessert, which led to their popular tamarind black sesame truffle. Susan will soon take over managing Sôcôla’s operations, sales, and marketing full time. She plans to systemize and streamline their production process, and find out if the business is expandable and sustainable enough to support one if not both sisters.